"Thich Nhat Hanh is a holy man.... His ideas for peace, if applied, would build a monument to ecumenism, to world brotherhood, to humanity." —Martin Luther King, Jr., nominating Thich Nhat Hanh for the Nobel Peace Prize in 1967. In this much-anticipated follow-up to his bestselling classic, Peace Is Every Step, Thich Nhat Hanh—one of the most revered spiritual leaders in the world today—offers an insightful guide to living a fuller life. In this deeply insightful meditation, the world-renowned Vietnamese Zen Buddhist master, poet, scholar, and peace activist illuminates how each of us can incorporate the practice of mindfulness into our every waking moment. 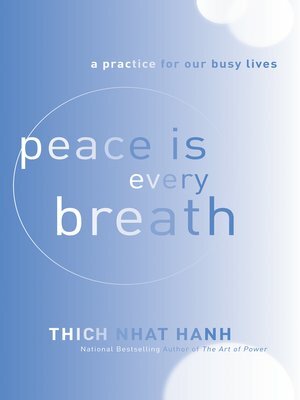 In the tradition of The Art of Happiness and Living Buddha, Living Christ, Thich Nhat Hanh's Peace Is Every Breath opens a pathway to greater spiritual fulfillment through its patient examination of how we live our lives.